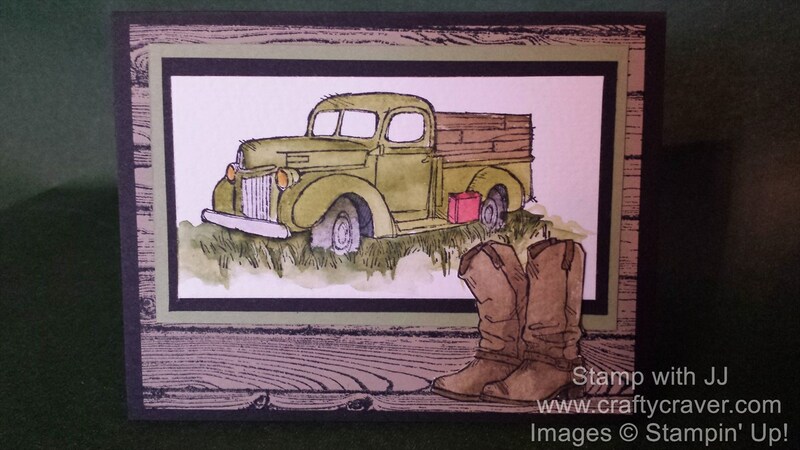 These cards are perfect for any man and some of us Southern women might enjoy them as well. And it might even jog a memory or two. 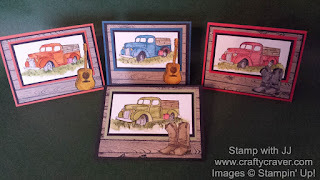 Practicing my watercolor shading techniques with the Country Living stamp set from Stampin' Up! Looked around on Pinterest for some inspiration and came across a card from Dawn Griffith and just had to try it. 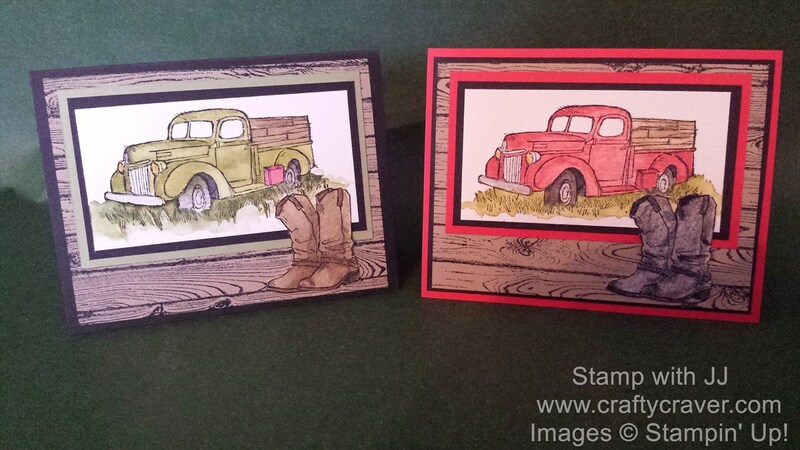 Hers was most like the green truck below, so I tried that one first, then the red truck, after all I love red. 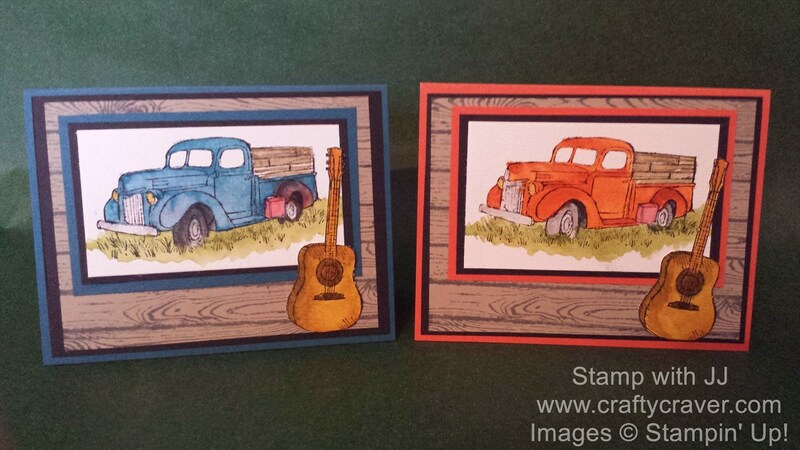 Then went with a slight variation and the guitar and the orange truck then the blue truck. If you look closely, I even tried to put a rusty fender on the back of the blue truck. Going for a little humor. 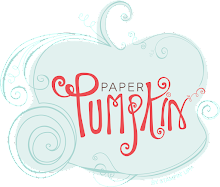 If you are trying watercolor, be sure and use watercolor paper. It's a mess if you try it with any other. 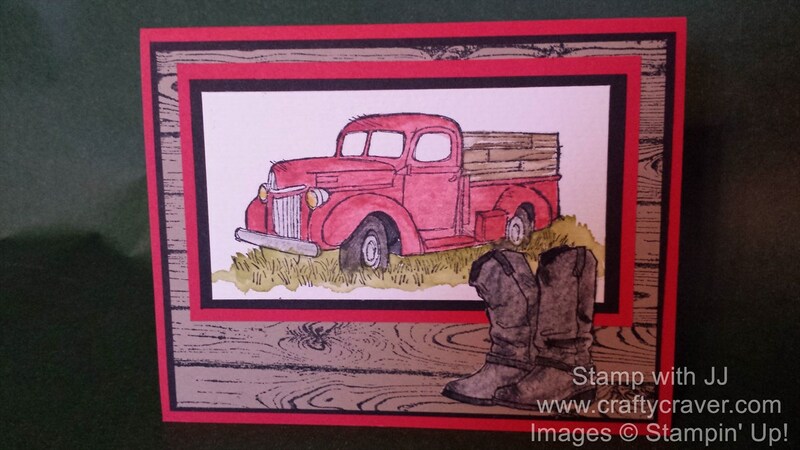 All cards use Crumb Cake card stock with the Hardwood background stamped on it; two Hardwoods are stamped with Memento Black Tuxedo and two are stamped with Basic Gray. 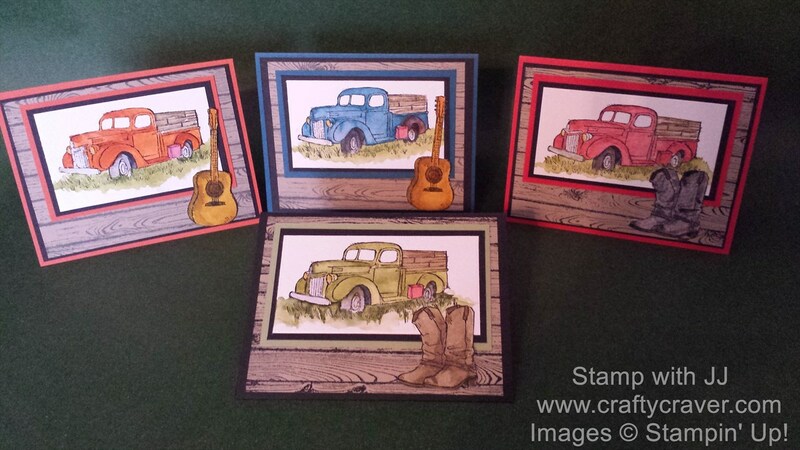 One set of boots is water colored using Crumb Cake and the other in Basic Gray and black. The guitars are water colored using Hello Honey, Crumb Cake, and Chocolate Chip. 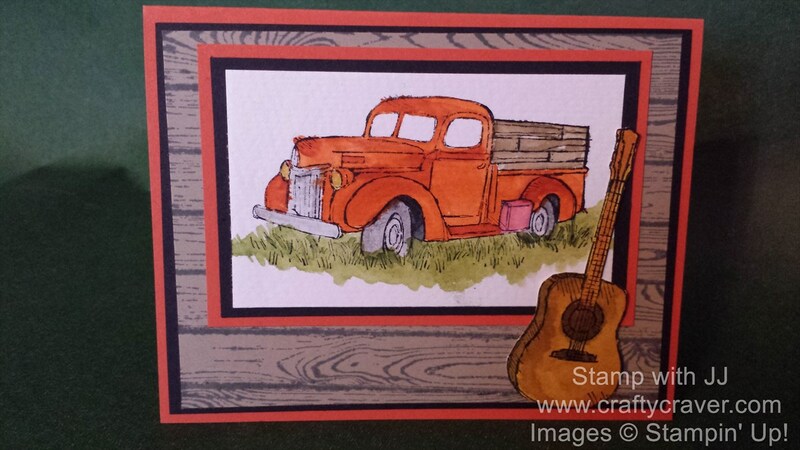 Real Red is used for the gas can on all of the trucks, the wood color is done in Crumb Cake. The trucks are Pear Pizzaz, Real Red, Tangelo Twist, and Dapper Denim. The shading is done by using varying amounts of water versus ink. 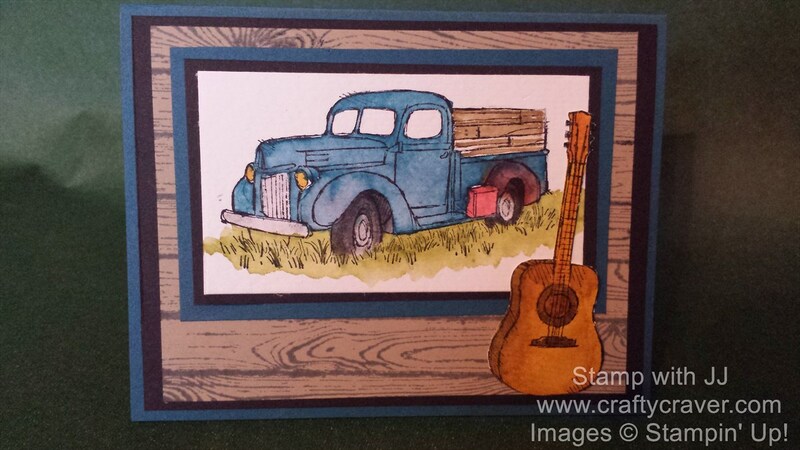 The rusty fender on the blue truck is done with Cajun Craze with a little blue overlapped on it. Hope you enjoy these cards as much as I do. Thanks for the inspiration Dawn!